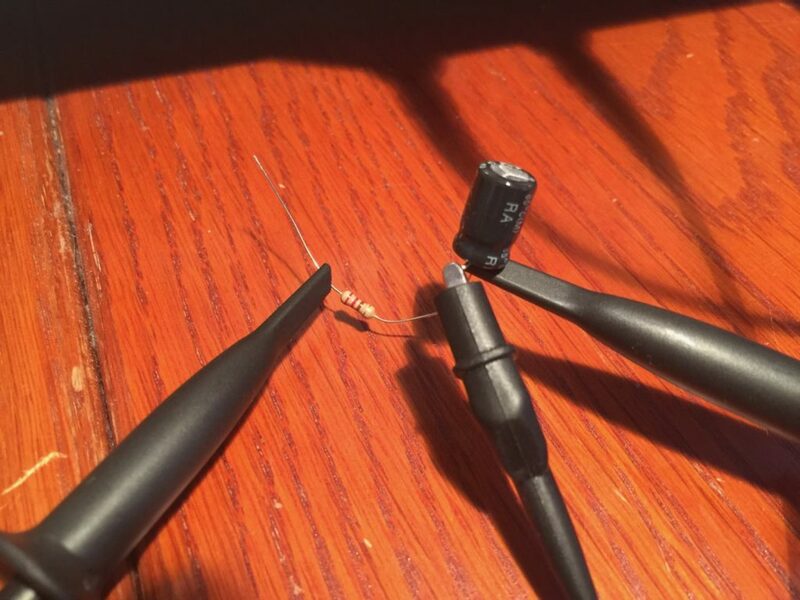 In the previous post I described another failure in my Razer Mako speaker system. I found a defective electrolyte capacitor and I said it started to “short out”, which isn’t correct. What happens is almost the opposite, namely that the internal resistance in the capacitor starts to rise, creating heat dissipation (which almost burned me) which ultimately destroys the capacitor. Meanwhile, before it actually gets destroyed, it becomes less efficient at doing its job of smoothing out variations in the voltage applied to it, which I saw as increased ripple on the corresponding power line. There’s a very good description of this phenomenon, an “increasing equivalent series resistance (ESR)” at Wikipedia. 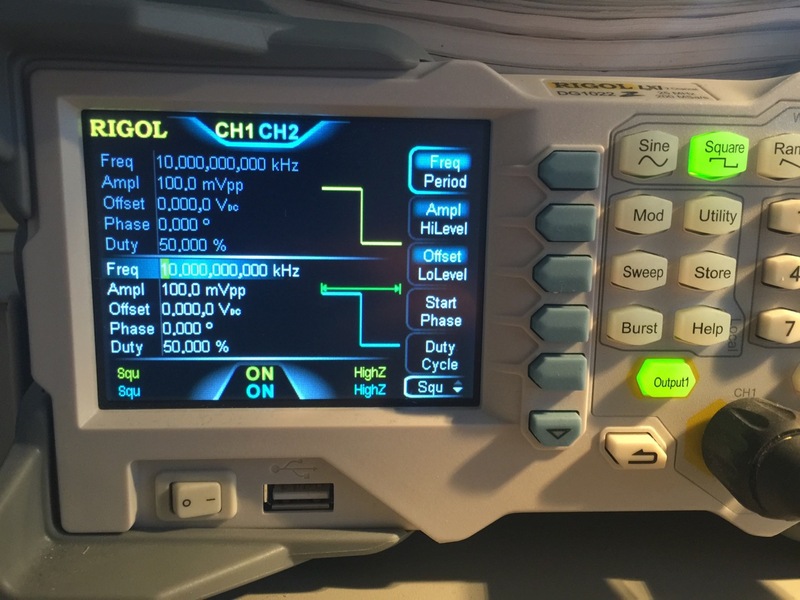 If you want to estimate the ESR in a capacitor, and if you have a signal generator and a scope handy, it’s extremely easy to do. All you need is a series resistor of a hundred or so ohms. You connect the signal generator in series with this resistor, then the capacitor you want to test between the resistor and ground. Hook up the scope probe over the capacitor leads. The 220 ohm resistor is in series. The “ESR” resistor is the internal resistance we’re looking to determine. Together with the capacitance in the schematic, it forms the device under test (DUT). Both grounds (scope and generator) are connected to “Ground” in the schematic. Incidentally, you can do this measurement in circuit as well, i.e. without removing the capacitor from the board. Since a good capacitor will show up as a short circuit at the appropriate frequencies, the test won’t be influenced by other components in the circuit. If you keep the generator voltage low enough (100 mV is low enough), you won’t switch on any semiconductor junctions in the circuit either. You’ll still need the 220 ohm series resistor between the generator and the device you’re testing, of course1. The defective capacitor connected to generator and scope. 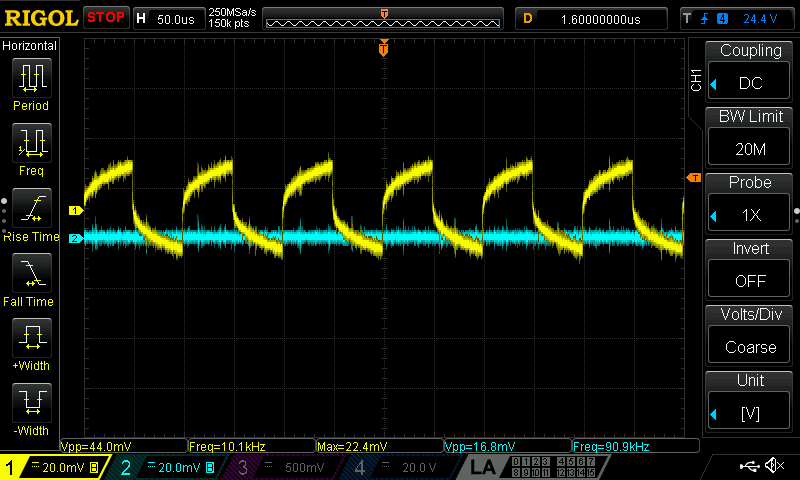 Set the signal generator to square wave and a fairly low output voltage, around 100 mV should be fine. At this voltage, polarity doesn’t matter. Set the frequency high enough that the capacitor with the capacitance it has ought to be effectively a short circuit. In other words, the lower the capacitance, the higher the frequency. In my case, I went for 10 kHz, but 100 kHz gave about the same results. I set both channels on the signal generator to 10 kHz square wave, 100 mV peak-to-peak. Finally, look at the trace. Does it look like a short circuit? If not, the ESR is probably too high. To be sure, do the same measurement with a known good capacitor and you’ll immediately see the difference. To make the comparison more clear, I hooked up the capacitor I replaced in the Mako (yellow trace) and a new capacitor (blue trace) at the same time. The difference is obvious, to put it mildly. The defective capacitor is 330 µF, while the known good capacitor was 220 µF, which shouldn’t make much of a difference. The blue trace shows what is effectively a short circuit, which is what you’d expect from a 220 µF capacitor at 10 kHz of input signal. The yellow trace is far from a short circuit, due to the internal resistance. Yellow trace is the defective cap, while blue shows the comparison, known good, capacitor. Yellow trace is connected to the defective capacitor, blue trace is now without any capacitor, for reference. 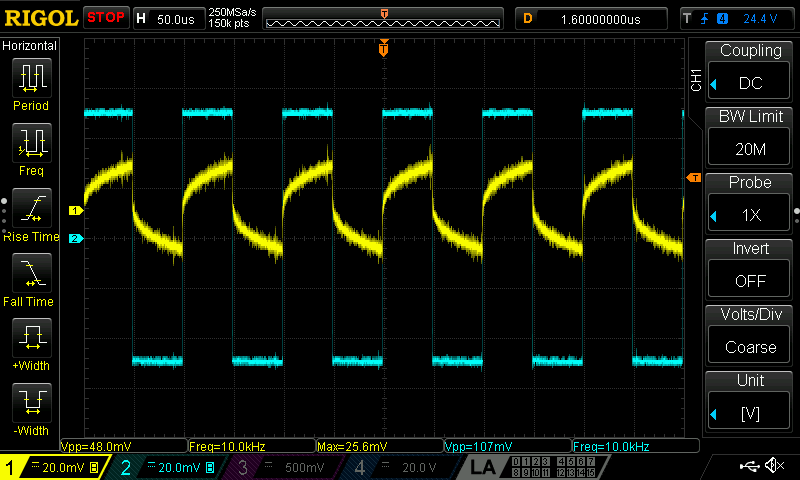 As you can see from the slope of the yellow trace, the capacitor is still working as a capacitor, but has a pretty large internal series resistance (ESR), which explains why it’s ineffective and also why it’s heating up. From the measured voltages of the traces (see Vpp below the traces), you can calculate the ESR value, but I didn’t bother. The pictures tell the story well enough. Do I have to say that you should only measure in circuit while the device is not powered?